Hardwood flooring is associated with luxury, beauty, and durability. Many home owners choose to install hardwood floors in their homes because of the sense of added value it brings to spaces. At Carrell Rogers Carpet One Floor & Home in Shepherdsville and Louisville, KY, you can be assured that we bring you only the best quality hardwood and brands. Hardwood is a versatile flooring product, which means you can find the right flooring that fits both your needs and style. If you’re all about staying on trend with in-home styles, then gray finished hardwood might be a great choice for your home. If you want to be more traditional but still stylish, wide plank rustic looks are an up and coming trend that’ll be sticking around for a while. The most common question we have been asked about hardwood is what the difference between solid and engineered wood is. Simply put, solid hardwood is one solid piece of wood, where engineered is multiple layers of wood with the grains running in opposite directions and a premium piece of wood glued to the top. Both types offer their own distinct characteristics that make them unique. Solid and engineered planks can be refinished in order to extend their life in your home. An advantage of engineered planks is they can handle more traffic and are more stable. But, solid hardwood features unique characteristics that stand out due to its construction. Since Kentucky is known to have a humid climate for most of the year, there are some things you should keep in mind when purchasing hardwood floors. Hardwood is made from real wood, so it can expand and contract with changes in moisture. When installing, make sure that there is enough room for the floor to adapt. 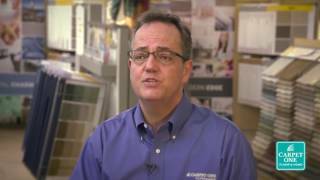 The flooring experts at Carrell Rogers Carpet One Floor & Home can give you more helpful advice about Kentucky climate and hardwood. Hardwood is recommended for home settings where there isn't significant foot traffic and moisture. Popular spots for hardwood are bedrooms and living rooms. The different types of hardwood require different areas of installation. For example, solid hardwood should be installed in cool, dry areas. Engineered hardwood, however, can be installed almost anywhere in your home including basements. We do not recommend installing hardwood in places around your home such as bathrooms or kitchens. Continue reading below to learn more about hardwood. Also be sure to stop by Carrell Rogers Carpet One Floor & Home showroom in Louisville, KY or Shepherdsville, KY, to speak with a flooring expert. Hardwood does more than just add a sense of value to your home. Read more about what hardwood can do for you and your home. Trying to decide which will be better for your home: Solid or Engineered Hardwood? Learn more about the differences here. Just like all other flooring products, hardwood has different advantages. Let us walk you through some hardwood advantages to see if they match your flooring wish list. We briefly went over some hardwood differences, now it’s time to go more in-depth and learn about the different hardwood types. Hardwood floors are naturally beautiful, but wear and tear will show overtime, so make sure you stay on top of your hardwood care and maintenance.